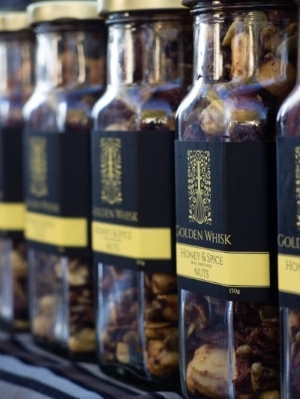 For wholesale confectionery, glazed or spiced nuts and fruit pastes, Golden Whisk can help! We offer all our gourmet confectionery, sweets and snacks in wholesale quantities and pricing. Our bold, simple packaging stands out on store shelves, and our products are perfect as individual gifts or as part of gift hampers for customers and corporate clients. They make a great alternative to traditional or imported candies and lollies, which are often targeted only at children. All of our wholesale confectionery, nuts and fruit pastes are also available in bulk uncut and unpackaged forms for catering, cooking and other uses. Wholesale orders can be collected from our Midland kitchen, or we can arrange delivery to your door. Our full retail range can be viewed on our Online Store, with brief summaries of our wholesale options below. For full details and our price list, contact Lucy, her details are below. We're very flexible, share your needs with us and we can help. Golden Whisk fruit pastes are a perfect accompaniment to most cheeses, pairing well with sharp cheddars and gooey soft cheeses, or as an addition to gourmet toasted sandwiches. They are also used in cooking, as a glaze or part of a sauce for meats for example. They come in cute glass jars with 150g of paste in each, either Spiced Plum Paste or Apple Paste. Four flavours of sublime, crunchy brittle. They come in 150g stand up bags, 70g snack size bags, or sold by the kilogram. In beautiful hexagonal jars, our glazed or spiced nuts look delightful on the shelf. With three varieties available, they're a versatile snack that can suit many occasions and drinks, and they are favoured as gifts. They're a great alternative to the usual wholesale confectionery fare, as they can straddle the line between sweet and savoury. If you'd like to use these for cooking or as a side for drinks or desserts, we can supply in bulk bags on a per kilogram basis. Chewy, melt in your mouth caramels, individually wrapped, then packaged in stand up bags of 150g, or snack sized bags of 70g. Our Chai Caramels are really something different for the discerning customer. Because of the individual wrapping, these make perfect alternatives to more traditional "fun size" lollies. As part of our wholesale confectionery range, we also sell these in bulk, cut and wrapped, but not bagged, for use in catering and cooking. Delicious and whimsical, adorned with coloured ribbon. Our gourmet salted caramel lollipops come in round, star or love heart shapes. More sophisticated than your average candy on a stick! Eight flavours, six of which are our smooth, creamy American style fudges, and two of which are our crumbly, English style. Our Salted Caramel Fudge is our all time best selling product at markets and events, where our customers can sample all our offerings for themselves. Fudge comes in 75g squares, or in bulk uncut slabs, by the kilogram. One of our most eye catching products! The colour combinations of bright green pistachios and deep red cranberries against a white chocolate background leap out at customers. A perfect Christmas colour combination. These come in 150g stand up bags, 70g snack sized bags or in uncut slabs, by the kilogram.